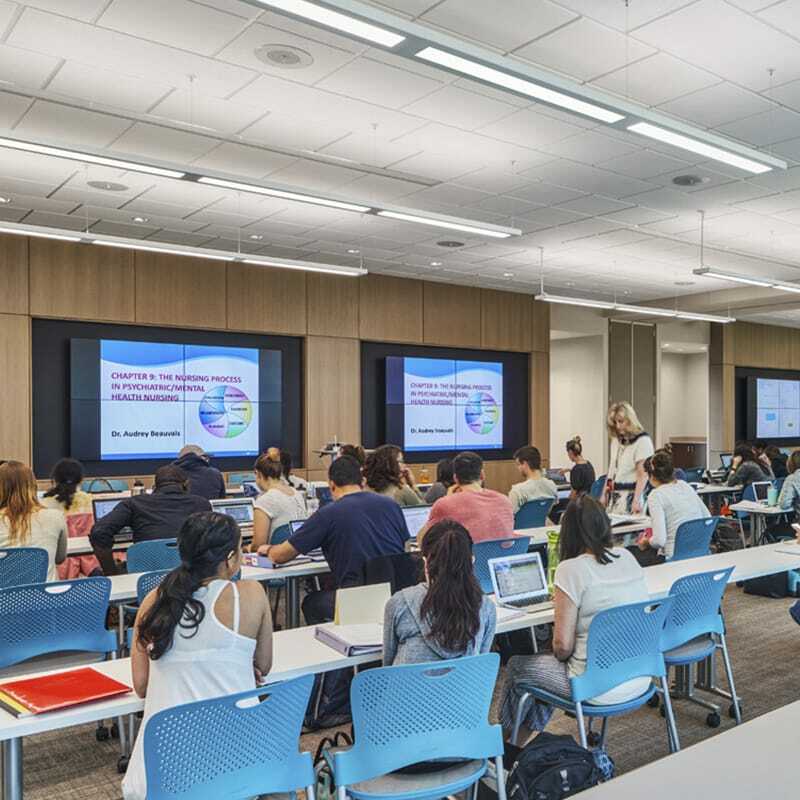 Gilbane aided in transforming this science, nursing and healthcare teaching environment to a specialty workspace that enhances real-world and real-time task training. Gilbane provided construction management at-risk services for the addition and renovation of the Marion Peckham Egan School of Nursing and Health Studies Nursing at Fairfield University. 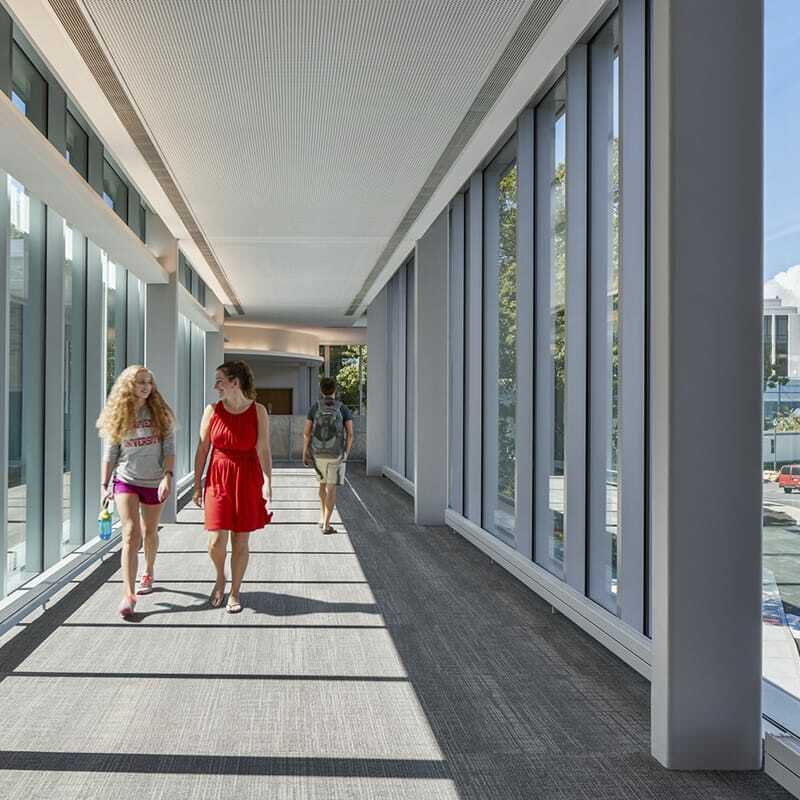 The University transformed the previously 16,000-SF, two-story building originally constructed in 1976 with a new, four-story 55,000-SF addition, providing more than 70,000 SF for the school’s facility. 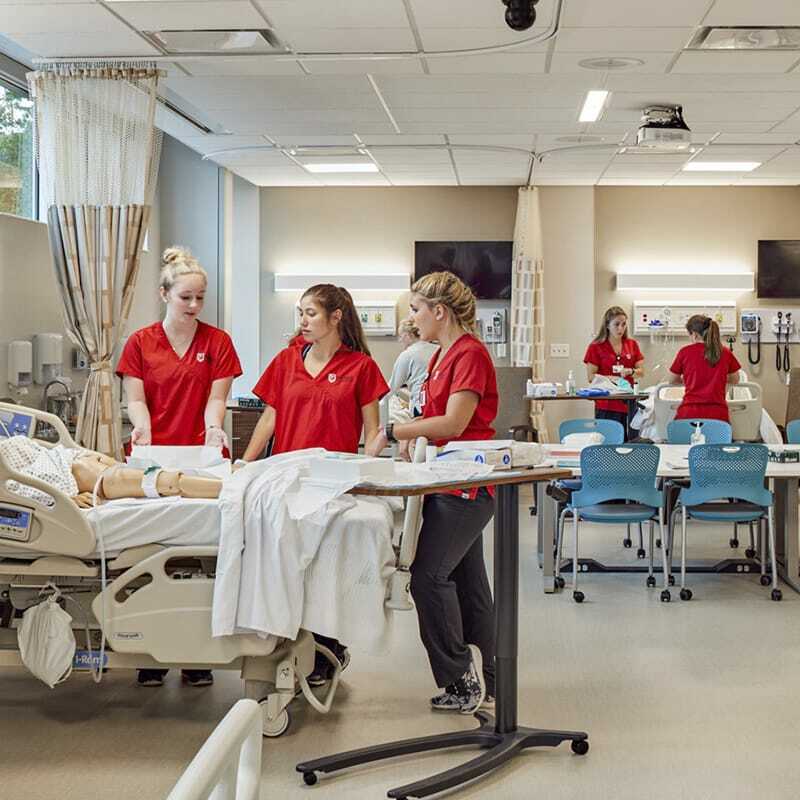 The Fairfield University Egan School of Nursing is a graduate and undergraduate nursing school ranked as one of the top 10 best schools in the country to earn a degree in nursing. The Robin Kanarek Center for Palliative Care, one of the few programs nationally to have dedicated space with the ability to accommodate 120 students. Classroom and small group collaboration spaces on the second and fourth floors. Additionally, the second floor houses a graduate health assessment area with 20 beds. This area is fit-out with simulation oxygen, air and medical gasses, and fully operational headwalls. Emergency Room simulation training area with 10 beds. The simulation areas are complete with fully functioning headwalls, task lighting, medical gasses, compressed air, oxygen and vacuums. The areas are designed to incorporate “Smart” manikins to aid in medical training. The manikin technology includes compressed air to simulate human breathing and power and data for the manikins to be remotely controlled for eye movement, blood pressure, speaking, muscle movement and fluid circulation. 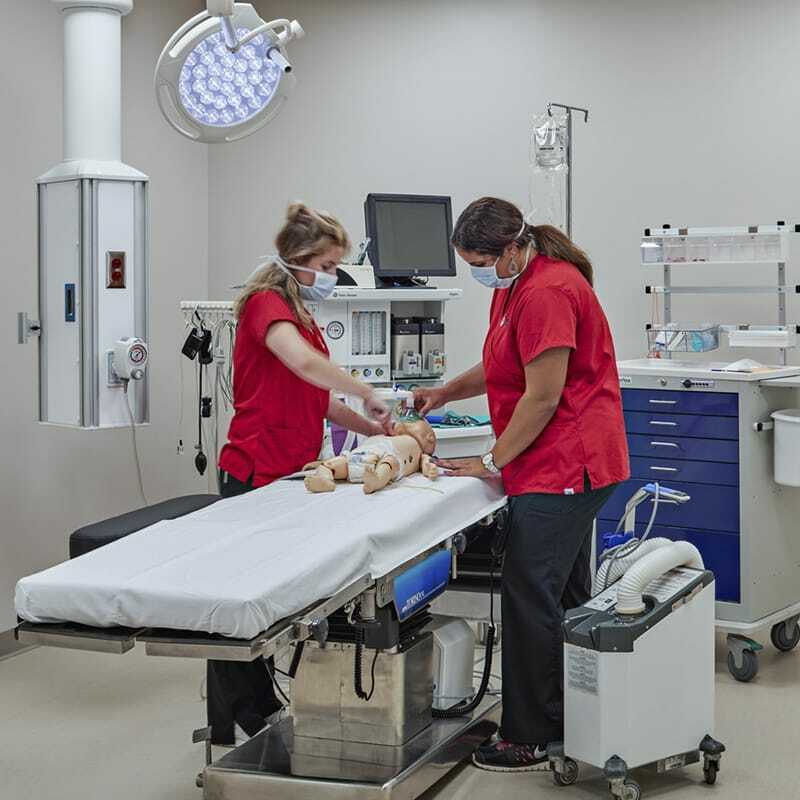 The simulation areas also feature one-way glass viewing areas to allow professors to remotely control the manikins’ behavior, including increased or dropped heart rate and muscle movement, so that professors can remotely observe student reactions to the various simulations. Many of the end users at the University had not been involved in a prior construction project and were not accustomed to visualizing new construction from 2D drawings. Therefore, the team opted to utilize virtual mock ups to ensure all team members could effectively experience and understand the designs. Through this highly successful and collaborative approach, the team was able to engage end users early to gather feedback and suggestions for the project. As an example, the nursing professors were given an opportunity to see the virtual mock-ups and undertake a virtual walk-through of the space early in the project. This collaborative approach resulted in a more effective utilization of the space and allowed for the early coordination of trade contractor staff in the field. Through these virtual mock-ups, the team was able to identify and address changes in the model, especially in the healthcare simulation areas, before being installed in the field. This also enabled pre-fabrication opportunities and efficiencies for the trade contractor workforce.